I am a descendant of one of the Mormon Battalion men who passed through southern Arizona December 1846. That man was Levi Ward Hancock. See photo. After trekking across the continent Levi settled in Utah's "Dixie," southern Utah, at a place called Washington. 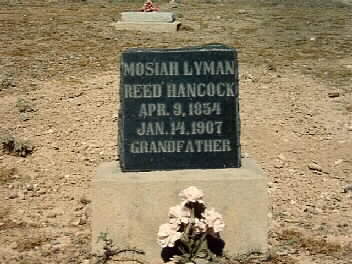 Levi's son was Mosiah Lyman Hancock See photo, and he served as a scout with the famous Mormon "Apostle to the Lamanites" Jacob Hamblin. The first foray into Arizona by M.L. Hancock was a trip to the Hopi villages about 1856. M.L. Hancock returned to Arizona in 1880. He built a home for his wife Margaret McCleve Hancock See photo in Taylor, near Snowflake, Arizona--I was born in Snowflake. (This original cabin was never destroyed. It was acquired later by my cousin Ronald Solomon and donated to the Taylor/Shumway Heritage Foundation. I myself often stayed in the cabin when I was growing up. It is now a museum! For a picture and history of the cabin click here). In the last year of M.L. Hancock's life he moved to the upper Gila Valley (Safford, Thatcher, Pima, etc.--not far from Globe) and died in Hubbard in 1907. He was my grandmother's grandfather. My grandmother remembered him vividly. All my ancestors on my mother's side were early Mormon pioneers in Arizona.